An 85-year-old man with no cardiac history was diagnosed with a 3-hour-old acute inferior-posterior ST-segment elevation myocardial infarction (STEMI) at home by ambulance personnel. He was brought to the cath lab for an emergency primary percutaneous coronary intervention (PCI) procedure after receiving 5,000 units of heparin intravenously, 500 mg aspirin intravenously, and a loading dose of 180 mg ticagrelor orally. Access for the primary PCI procedure was through the right radial artery. Because the circumflex artery was the suspected culprit vessel, the procedure was started with a 6-F Judkins right 4 (JR 4) catheter to visualize the presumed nonculprit vessel first. Figure 1. 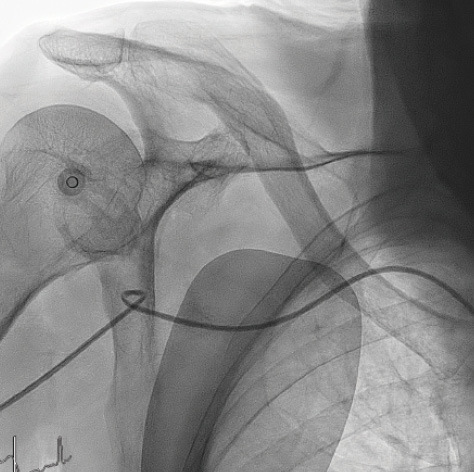 Image of the fixed kinked and looped catheter in the axillary artery. The right subclavian artery and brachiocephalic trunk was very tortuous and calcified, and we could pass the catheter and engage the ostium of the right coronary artery only after use of a hydrophilic 0.035-inch guidewire (Radifocus Guide Wire M, Terumo Europe). Unfortunately, with the attempt to torque the catheter into the ostium of the right coronary artery, a kink occurred in the catheter, 20 cm proximal from the tip at the tortuous subclavian region. Upon retraction of the catheter, another kink and loop in the Judkins right catheter formed and got stuck in the axillary artery (Figure 1). The catheter could not be moved forward any further. Attempts to unknot and unkink the catheter with counter rotations and the use of standard 0.035-inch (including the stiff end) and hydrophilic 0.035- and 0.014-inch guidewires were unsuccessful. No wires passed the first proximal kink. How would you manage the very tortuous subclavian-brachiocephalic artery in general and during primary PCI in a radial procedure? Dr. Abdel-Wahab: Tortuosity of the right subclavian-brachiocepahlic arteries is not uncommon, particularly in elderly patients and those with known peripheral artery disease. If this is known or can be anticipated, the use of the left radial artery or the femoral artery for access would be an option to facilitate catheter advancement and smooth intubation of the coronary arteries. If this is encountered during the procedure, I would advance and torque the catheter on the guidewire until intubation of the coronary ostium has been achieved, which facilitates coronary engagement and prevents inadvertent kinking of the catheters. Dr. Paradies: The goal of STEMI treatment is early reperfusion. The benefits of radial access in terms of reduced major bleeding and mortality are particularly evident in STEMI patients undergoing primary PCI. Therefore, the transradial approach has gained significant popularity and is considered the preferred access site. However, even experienced operators may encounter transradial challenges and complications that require crossover to a femoral access site to preserve reperfusion times. Approximately 10% of patients undergoing transradial angiography have severe tortuosity of the right subclavian artery, such as subclavian loops and retroesophageal subclavian arteries. Most of these cases can be solved with deep inhalation and use of hydrophilic guidewires. In the case of severe tortuosity, performing coronary cannulation with a stiff 0.035-inch wire inside the catheter, ideally using a guiding catheter and a Y connector, may prevent catheter kinking or knotting. However, bearing in mind that the goal of primary PCI is immediate reperfusion, an excessive tortuosity may impose early conversion to a femoral approach. Dr. Danse: In case of a tortuous subclavian-brachiocephalic artery, it is challenging for the operator to engage the ostia of the coronary arteries. Generally, a hydrophilic wire is needed to pass the tortuous and/or calcified route. A JR 4 is, in my opinion, the best steerable catheter to engage the ascending aorta. To engage the ostium of the right coronary artery, the operator should try to torque the catheter with a standard guidewire inside, in case the tip of the catheter is not responding. In my experience, it is more favorable to directly change the JR 4 catheter over a long (> 260 cm) guidewire for an Amplatz right 2 catheter, which in this situation is more suitable to engage the ostium of the right coronary artery. To engage the ostium of the left coronary artery, Judkins left catheters would not be my first choice in case of a tortuous subclavian-brachiocephalic artery; extra backup catheters (XB, Cordis, a Cardinal Health company; EBU, Medtronic) not only pass more easily through the tortuous artery trajectory but also engage better in the ostium and have a more stable fit. In case of a primary PCI and a tortuous subclavian-brachiocephalic artery with difficult engagement into the ascending aorta and difficult manipulation of the catheters, the operator should not hesitate to change access to the femoral artery. This generally takes much less time than long-lasting attempts to manipulate the catheters into the coronary ostia via the radial artery. How do you prevent and manage kinking in the guiding catheter? Dr. Paradies: Kinks usually occur with aggressive rotation of catheters during cannulation of coronary arteries. The best prevention is to avoid rotating the catheter more than 180°, which may result in proximal torque that is not transmitted to the catheter tip. A balloon-assisted tracking technique may overcome severe tortuosity of the subclavian-brachiocephalic artery. This technique requires a semicompliant balloon advanced over a 0.014-inch angioplasty wire placed across the tip of the catheter and inflated at low pressure. By tapering the distal edge of the guiding catheter and maintaining the coaxial alignment, this technique reduces the resistance encountered at the tip of the catheter. Careful monitoring of the pressure tracing while torquing and performing opposite rotations when the pressure curve is partially reduced may help in preventing catheter kinking or knotting. Moreover, the radial artery has a well-developed α-adrenergic system that makes it prone to develop intense spasm and precipitates the scenario. If kinking or knotting of the catheter occurs, I approach the entrapped catheter by giving adequate spasmolytic agents and attempting gentle maneuvers. I would then try to manage this complication conservatively by counter rotating to the initial torque and straightening the catheter by crossing it with a hydrophilic or stiff wire. Occasionally, complex loops are not susceptible to these maneuvers and catheter deformation may result in vascular entrapment. The most common rescue techniques include (1) external compression of the upper arm using a sphygmomanometer to fix the tip of the catheter and allow untwisting, (2) increasing the pressure inside the catheter (achieved by an indeflator connected to its hub), (3) use of larger sheaths to encase the kinked catheter region, (4) use of vascular snares, or (5) a balloon retrieval technique. Awareness of rescue maneuvers is crucial to avoiding major vascular complications. Dr. Danse: Kinking of catheters is a recognized complication and is usually the result of excessive torquing, especially in a tortuous subclavian-brachiocephalic artery or aortoiliac system. The experience of the operator in handling catheters, knowing and feeling the torque and tension of the catheters, is most important. Kinking can be prevented by putting a guidewire within the catheter during torquing. In cases using femoral access and a tortuous aortoiliac system, a long (> 45 cm) sheath can be helpful. Normally, kinking can be managed with counter rotations and the use of a standard or hydrophilic guidewire (0.014 or 0.035 inch) to unkink the catheter. However, regular maneuvers and manipulations to disengage the catheter might be unsuccessful, especially due to the narrow diameter of the artery. Dr. Abdel-Wahab: Prevention is mainly achieved as previously described, particularly by using the guidewire during catheter manipulations in tortuous calcified vessels. When it’s believed the torquing maneuver is not being transmitted to the catheter tip, overtorquing the catheter should be avoided. If kinking occurs, the first step would be to try and reverse the kink by reversing all torquing maneuvers, usually in a counterclockwise rotation and under fluoroscopic control. Advancing the wire through a kinked catheter may be helpful, but care must be taken not to advance the straight tip with force, as this may tear the catheter at the kinked/knotted portion. How do you resolve the specific problem described here of a kinked and looped catheter? Dr. Danse: In the presented case, the kinked and looped catheter was fixed in the axillary artery and even PCI wires could not pass the proximal kink. The operator can then try to pull the catheter into the larger lumen of the aortic arch with a snare through the femoral access. As a result, because of the larger artery lumen, counter rotations and the introduction of guidewires may resolve the kinked loop in the catheter. Dr. Abdel-Wahab: As this complication occurred in a patient with an acute STEMI, my first step would be to leave the radial catheter in place and crossover to the femoral access and revascularize the patient as quickly as possible. Afterward, I would retry the previously described maneuvers to resolve the kink. If unsuccessful, I would introduce a snare through the femoral access, grab the catheter, and attempt to resolve the kink by untwisting the catheter from both the radial and femoral side. If again unsuccessful, I would cut the catheter distal to the radial sheath and completely snare and remove it from the femoral access site, which could mandate upsizing the femoral artery sheath size upfront. Dr. Paradies: The patient has an inferior STEMI that deserves emergent coronary angiography and treatment of the occluded vessel. Options at this point are the use of the left radial artery or crossover to femoral catheterization. Despite the lower complication rates of the transradial approach, I would switch to a femoral approach to attempt, after reperfusion, removal of the entrapped and kinked catheter by means of snares or a balloon retrieval technique. After performing primary PCI of the culprit vessel via femoral access, I would advance a 7-F JR 4 catheter into the aortic arch and to the subclavian artery. My first treatment option would be a balloon retrieval technique. I would try to advance a 0.014-inch angioplasty guidewire through the 7-F JR 4 into the tip of the kinked catheter and inflate a semicompliant balloon to fix the kinked catheter from inside. I would subsequently apply gentle backward traction to the inflated balloon to untwist and retrieve the entrapped catheter or advance it toward the subclavian artery where it can be snared. The use of the balloon retrieval technique is cheap and available in all cath labs and may overcome the lack of an available appropriately sized snare. In the case of failure, I would exchange for a snare delivery catheter, which may guarantee a firmer grasp and retrieval of the entrapped catheter. A Guideliner catheter (Teleflex) may be used as an extender of guide support to solve length limitations of the snare delivery catheter. The procedure was continued by gaining access to the right femoral artery. An 8-F introducer sheath was inserted and diagnostic coronary angiography was performed. Coronary angiography revealed single-vessel disease with a culprit thrombotic 90% stenotic lesion in the mid right coronary artery and only mild diffuse atherosclerotic disease of the left coronary artery. A drug-eluting stent (3 X 18 mm) was placed in the right coronary artery with a good angiographic result and restoration of TIMI (thrombolysis in myocardial infarction) 3 flow. After treating the emergent problem, attention was brought back to the kinked and fixed right catheter in the axillary artery. An 8-F JR 4 guiding catheter was introduced through the femoral sheath to the origin of the brachiocephalic trunk. A Curry intravascular retriever snare (Cook Medical) was introduced through this Judkins right guiding catheter after shaping the tip of the snare to a 90° angle. After multiple attempts, the tip of the right catheter was caught in the lasso and the right catheter was pulled back into the aortic arch where it had more space (Video 1). With retraction of the catheter into the aortic arch, the right catheter loop was unfolded (Video 2). By turning both right coronary catheters in counterclockwise movements, the kinks in the catheter were unwound, and a guidewire could be inserted again (Video 3). Finally, the goose snare was released and the right coronary catheter was retracted through the radial sheath (Video 4).